This week, comments from a Rockstar co-founder cause debate and controversy around “crunch culture,” Activision Blizzard stocks take a hit despite Call of Duty’s success, and PlayStation 4 users receive system-crashing, malicious messages. Earlier this week, in an feature with Vulture, Rockstar co-founder Dan Houser mentioned that members of the studio behind the upcoming “Red Dead Redemption 2” often had 100-hour work weeks while preparing the game for launch. These comments, meant to show the passion and hard work put into the heavily anticipated sequel, instead prompted controversy around the studio’s treatment of employees and stirred much discussion about “crunch culture” in the games industry. The Verge reported on these comments being “very disappointing,” pointing to recent cases of unethical employee treatment from studios like Telltale Games, and cited crunch culture as a prominent topic at this year’s Game Developers Conference. Kotaku reported on a follow-up statement from Houser, in which he clarified that these 100-hour work weeks were electively carried out by senior members of the team that are particularly passionate. 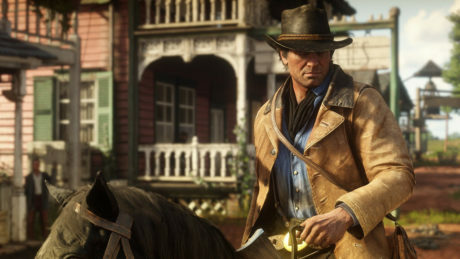 Houser declared that they would never expect such hours from their employees and that “additional effort is a choice.” Gamesindustry.biz reported on members of the games industry relaying their own horrific crunch stories, affirming that crunch culture has become an unfortunate but expected phase in game development. In response, Rockstar lifted their ban on social media and encouraged their employees to tweet about their experience at the company. Ars Technica compiled said tweets, with Rockstar employees reporting generally positive experiences counter to the ongoing narrative prompted by Houser’s comments. Many stated that, while crunch culture was present at Rockstar, they never had 100-hour work weeks, though some reported daunting figures like 79-hour work weeks. This year, Activision shipped its first-ever, multiplayer-only edition of Call of Duty and broke multiple franchise records for digital sales and player engagement. Forbes listed out said franchise records, and noted that the PC player base was double that of last years, indicating that “[the franchise] may finally have legs on PC.” While Call of Duty: Black Ops 4 has been well received for its tight multiplayer and acclaimed new Battle Royale mode, the game’s sales failed to impress Activision Blizzard stockholders according to The Next Web. Even though the game made $500 million in its first three days, previous installments of the game reported similar sales figures, and shareholders seem like they expected more from this year’s release. Nasdaq noted that, despite breaking the franchise’s digital sales record, Activision has not yet disclosed physical sales, and the crowded holiday release season may have stymied the game’s sales. PS4 users have been receiving malicious messages over PSN resulting in hard-locked systems. Kotaku reported on such user experiences posted on the PS4 subreddit, in which players received a message through the system’s messaging application that prompted “continual error loops,” crashing their consoles in the process. Members of the subreddit found that setting messaging to “private” would prevent the receipt of such messages, and advised fellow community members to do so. ZDNet pointed out a Reddit user who observed that some Rainbow Six: Siege players had recently skyrocketed up the game’s rankings by sending such messages to their opponents, calling for their banning. Eurogamer reported on Playstation UK acknowledging the issue and providing instructions on how to restore the crashed consoles, but also pointed out that Sony has yet to make an official, full statement on the issue.